Iroquois Midwinter Ceremony History & Cartoon Fun by Brownielocks. The Iroquois Midwinter Ceremony is held in either January or February. 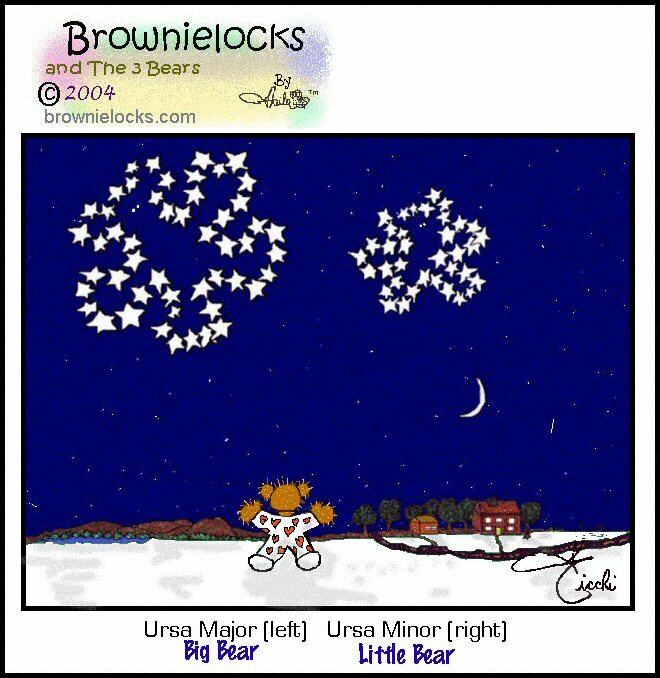 When the dipper constellation (not our teddy bear one in the cartoon!) appears in the sky directly overhead, you then wait for the new moon to be seen. This is when the spiritual year begins. You then wait 5 days after the new moon to begin the ceremony. The celebration lasts 9 days with a lot of traditional events, as well as choosing new council members for the next year. Mohawk, Oneida, Onondaga, Cayuga, Seneca and Tuscarora. Because the Mohawk flag is purple and white, I chose to use that color scheme for this page. This is also known as the "New Year's Ceremony" because it marks the beginning of a new ritual year. The "Big Heads" announce this ceremony. They are masked messengers who visit the longhouse (a bark covered structure where the Iroquois used to live) now used as a public activity space. The Big Heads invite everyone to participate. There is no specific order to this ceremony. Each tribe has their own way of doing it. But the usual custom is to first begin with the "Stirring of the Ashes" as a symbolic gesture of showing gratitude for all the blessings bestowed during the previous year. There is a public naming event where all the children born during the previous year are now given their Indian names. There are also two traditional Indian dances, The Bear Dance and the Feather Dance. Tobacco is an important element in many Native American celebrations. In the Midwinter Ceremony, they have a Tobacco Invocation ceremony that represents a way of communicating to the Creator, both a message of thanksgiving, as well as a plea for a successful growing season for the new year. The Iroquois also believe that dreams are not just fantasies. They feel dreams represent a cure for diseases and mental disorders. So they have a Dreamsharing Ritual. They feel that by getting people to share their dreams in public, getting opinions on what those dreams might mean, the Iroquois believe that they are better able to resolve whatever problems or conflicts gave rise to the dreams in the first place. They have a group of medicine men known as The False Face Society, who perform the appropriate curing ritual once these dreams have been interpreted. One of the highlights of the Midwinter Ceremony used to be what was called The White Dog Sacrifice. It is no longer done! Instead today, instead of a dog, they use a white basket. For more on this read further below under the specific customs. However, it could be a bit disturbing for animal lovers and some children. The Midwinter Ceremony ends with a speaker who gives a summation of the 9 days of the celebration. He also gives a brief thanksgiving address. It is at this time that the new council members (who have been chosen for the upcoming year) are introduced to the crowd at the longhouse. The rest of the tribe's members are now purified and released from the burden of their dreams. And a new year is now welcomed. The Bear Dance is a medical curing ritual. Iroquois Bear Dancers include both men and women. Their movements are a somewhat lumbering, waddling mimic of a bear as they dance in a counterclockwise circle. This bear dance can be performed publicly or privately for a sick person. It is done for the purpose of curing people of their problems and any misfortunes that have beset them over the past year. The Iroquois refer to them as "Our Uncles" because they represent the tribal founders. The Big Head messengers dress in buffalo skins and cornhusk masks with braids. They carry wooden mallets used to mash corn. This symbolizes both hunt and harvest. They make visits throughout the village at the New Year to announce the festivities start. When at a house, they take their mallets and stir up the ashes in the household's fire. Why? They consider it a symbolic gesture of gratitude to The Creator. While doing this they also ask that the New Year bring renewal and fertility to the earth. Ashes symbolize the earth to which all living things return and that life springs from. After the "Stirring of the Ashes" (described above) there is often the sprinkling of the tobacco on the burning embers. The smoke from the burning embers is believed to rise up to heaven, taking with it the message of thanks to their Creator. The Iroquois are also referred to as "The Tobacco People" or "Tobacco Nation." The word "ierokwa" is where their name originates from and it means "they who use tobacco." Besides using tobacco for ceremonial purposes and communicating with spirits, they also use tobacco to treat burns, sores, the pain of a toothache and diseases. Tobacco was the one crop that women were not responsible for cultivating. When Naive American men got together to make peace or conduct their business, they often shared a long-stemmed pipe of tobacco called the calumet, which they believed induced "good thoughts." This is a sacred activity in which the Iroquois try to get rid of troubling thoughts and make their wishes come true. It is also known as "Dream Guessing." What they do is describe their dreams in front of the tribe members. After listening, this assembled group then offer their interpretations and suggestions. The purpose is to try to help the dreamer identify exactly the dream is trying to relay to him: a need, a wish or a desire. Sometimes people reenact each other's dreams; and, then invite the spectators to guess what they mean. Those that come up with the most accurate dream interpretation are then required to help see that the dream is fulfilled. This is done by either presenting the dreamer with symbolic gifts or by actually helping him/her satisfy their needs. The Dreamsharing is considered a central part of the Midwinter Ceremony because they believe it helps people be cured of their illnesses that are symptomatic of unresolved conflicts and/or unfulfilled desires. The person who correctly interprets someone's dream and then helps to resolve their situation is honored. It's not considered an obligation. And, by doing this it is felt that tribal traditions and friendships are cemented. This society is a group of medicine men who wear masks carved out of a living tree. They have deep-set slits for the eyes. The noses are large and extend across the forehead with a spiny ridge or crease. The False Face Society members are believed to possess the power to scare off evil spirits that cause illness. The group holds its most important meeting in the longhouse during the Midwinter Ceremony. The members participate in the curing rituals, often reaching into the hot ashes of a fire without burning their hands. Then they rub or blow off the ashes on to those in need of a cure. Although both men and women can belong to the False Face Society, only the men wear the masks. This dance is performed for the purpose of giving thanks to The Creator for all he has bestowed on the people during the past year. The dancers dance to two singers who sit face-to-face. Turtle shell rattles are used to create the rhythm. The dancers are dressed in full tribal regalia. The dance is held on the 8th day (next to last night) of the 9-day festival. This dance is considered one of the "Four Sacred Ceremonies" essential for salvation as named by the 18th Century prophet, Handsome Lake. This is another one of the "Four Sacred Ceremonies", which symbolizes the game played by The Creator and his evil brother as they competed with each other during the creation of the earth. Six peach stones are either burnt or blackened on one side. Then they are put into a bowl and shaken. The score is based on how many of the "black" sides and "white" sides ends up showing. This is a game of chance a lot like dice, or flipping a coins heads or tails. When it's played during the Midwinter Ceremony, it symbolizes the renewal of the earth, especially the battle for survival that fruits and vegetables have against the harsh elements of Nature. The outcome of this game is used to predict the success of next year's harvest. It also symbolizes the good luck that The Creator has bestowed on the inhabitants of the earth. Men play against women. One clan can play against another clan. The game can go on for as long as two days! Bets are often placed also on who will win. The following information could be disturbing to animal lovers and some children. Use your discretion when reading it. The central sacrificial rite of the Midwinter Ceremony involved the killing of a white dog. This is no longer done today because the Iroquois love their dogs and to have one of their pets killed as a sacrifice was a sign of how seriously the actually took this ritual. Killing a white dog symbolized purity. So sacrificing the dog was a way of purifying the entire community. The dog was killed by strangulation so there would be no marks on it. It was decorated with red paint, feathers, beads, wampum and ribbons. It was then laid on the fire, and then a basket of tobacco was thrown on the flames. It was the belief of the Iroquois that the smoke would carry their gratitude and prayers to heaven. As I said, this is no longer done today. Instead they use a white basket as a substitute of burning a white dog.